11/07/2018 - A compelling stand, a motivated Biobest team and hordes of enthusiastic visitors from around the world made the prestigious GreenTech Horticultural Fair a thoroughly successful event for Biobest. On 12th and 13th June, the RAI convention centre in Amsterdam was temporarily transformed into the beating heart of the horticultural sector. Some 10,000 visitors from 112 countries flocked to this celebrated event, lending it a more international flavour than ever before. 50% of visitors hailed from the Netherlands, yet that same percentage also travelled from many other corners of the globe. From neighbouring Belgium to Japan and Canada. Visitor numbers were also 8% higher than two years ago. "These combined factors conspired to make GreenTech the perfect forum for networking," enthuses Koen Van Elsen, Area Manager at Biobest. "We not only spoke to many of our regular customers; we also forged new contacts. We realise that integrated crop protection - IPM - is an increasingly important issue for growers around the world. Our Biobest colleagues can offer bespoke advice on making organic pest control an integral part of their day-to-day operations." What was particularly special about this year’s event, was that Biobest was nominated for no less than two awards for their comprehensive solution to Tuta absoluta. We’re extremely proud that our persistent hard work was recognised by these nominations in the 'GreenTech Impact Award' and 'GreenTech Sustainability Award' categories. We’d like to take this opportunity to thank you for your visit. 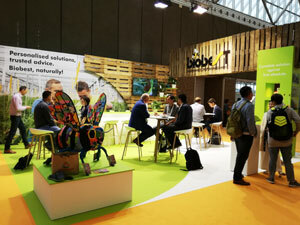 If you have any further questions or were unable to attend GreenTech, then your Biobest advisor will be happy to assist. Indeed, our exhibition theme of 'Personalised solutions, trusted advice. Biobest, naturally!' remains our abiding motto, day in day out.